Please comment with your stories and pictures! Route: up Mozart, to Chestnut, to Preisling, to Mozart again; ending by the JFK Elementary School in Jamaica Plain. ​Thank you Jean for the video! On Sunday, December 20, 2015, the 12th annual Caroling Mob met in Jackson Square and walked across to the Academy Estates subsidized housing complex in Roxbury. It's built on a hill, and there are different levels and eras represented on the hill; the bottom level looks like a state university built in the sixties, with long buildings sheathed in colorful corrugated metal siding. Upper levels were more modern-looking and more populated- the lower levels seemed pretty empty (but spirited! when we found people!). 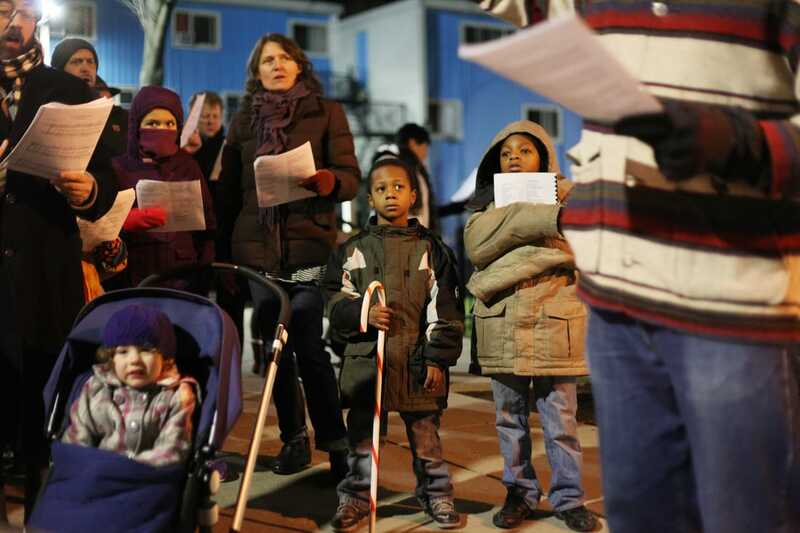 Kids got dressed and came out to stand and listen, and guide us to the next place to carol. People would request songs and then hold their phones out the window to record and send to their loved ones. Very sweet. All in all a very satisfying outing. Send pictures or videos if you have them and I'll post them! Check out CBS Local's plug for us back in 2013. Great time afterwards at James' Gate Pub, singing Tom Lehrer and other songs. Hark the Herald Tribune Sings! Advertising Glorious Things! After meeting at Stony Brook, about 40 of us traveled up towards Egleston Square, past the house of Bonnie Rovics, who provided some merry libations. We were joined by the Consul General and the Vice Consul from El Salvador (both of whom had been involved in the Missionaries concerts which I had directed, Dec 2-4 2010). Beautiful harmonies. Cookies! We ended at Bella Luna, where some of us more stalwart singers stayed for dinner. And sang. Lovely. BLIZZARD! Snow snow snow! Oh my goodness. Lots of snow. What a winter wonderland. Singing our way out of Forest Hills, up Tower Street, back to dinner at the Dogwood Cafe... (who were kind of grumpy about us arriving, actually.. where's the spirit!?)... Tower street was so nice! Several houses offered cookies, invited inside two or three of them. Slight splintering of group as some stopped for cider here and others went on to there for cookies. 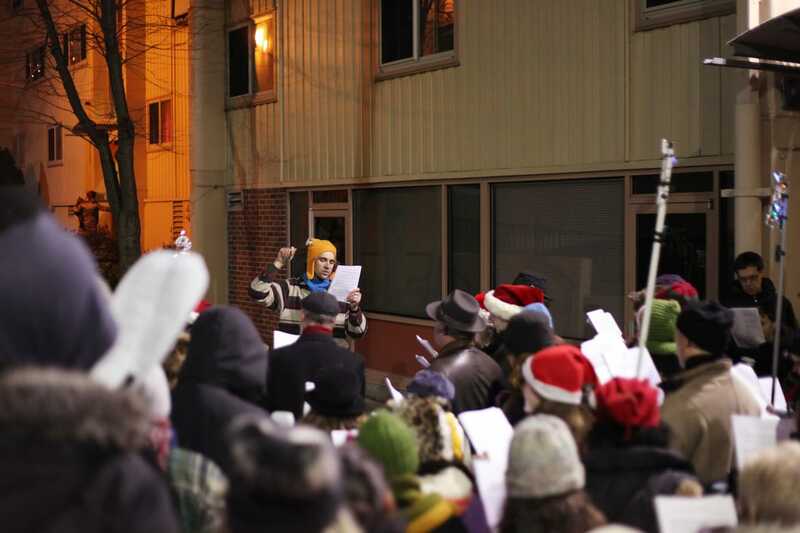 Just a picture perfect caroling outing. This year we met at Jackson Square T stop and meandered our way up to the Milky Way in Hyde Square. Props to the owners of the Milky Way who provided us with hot cocoa and quesadillas! Hooha! We went into Stop and Shop and sang in the fruit and veggies section... that scene appeared in the Boston Globe article that Christine Junge wrote about us. There were seventy of us in there... Sadly, despite my bilingual poster and ad in the Banner and so forth, it was pretty much a white group (I'd be happy for some more help in the outreach department! hint hint!) but it made for a pretty funny moment when a guy started leading us around the store saying, "I'm the black Moses!" I'm not sure, actually, looking back, why it was so funny, but we all (including Moses) laughed a lot. After we let the Stop and Shop, we sang in a courtyard that had some nice decorations and a bunch of people listening. After we were done a guy came up and told us that we had totally made his Christmas- he'd been in the country for 26 years and this was the first time that Chriistmas wasn't depressing for him. Aw! But he was not, contrary to the Globe article, an old man. He was 50ish. I hope he didn't read that and retroactively repeal his warm fuzzies. JP's Paul Daigle also led a caroling excursion the same night, and it turned out we were both near the Milky Way at the same time, so we hooked up and sang together a little. Then we went inside and they continued. I really liked the character of that group... they had drums and jingle bells and a girl being pushed around in a shopping cart. Very cute! Very cool! After quaffing a few at the Milky Way, we decided to go up and see if the Cranston block party was still going on- by a coincidence, their party has...errr. coincided... with the Mob outing for the past 2 years. They had invited us to come and sing; I had thought that there might not be any interest after a few hours in the cold, but lo and behold, about 30 of us made it up the hill and- and------ the party was over! but! a guy saw us coming and banged on everone's door and they all brought leftover cookies for us anyways. 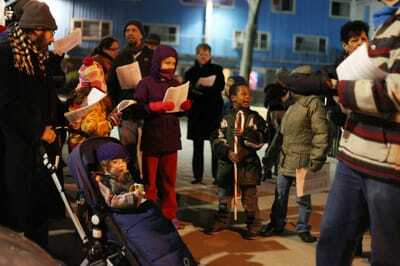 And we sang a mini concert out there on the street- 4 songs or more- after we thought we didn't have any energy left. Ho ho ho! and we'd a kept going too! I wanted to share with you some of the experiences I have encountered while singing at Christmas time. I've participated in the Caroling Mob twice, and on the second time I brought an old friend and his girlfriend. Now his girlfriend happens to be the sister of my girlfriend, and my old friend and his girlfriend just got engaged which now makes my old friend my brother-in-law, which is strange but clearly beside the point. Anyways, his girlfriend is a very shy person amongst big crowds, and would never think of opening her mouth to sing in public. We basically had to drag her to the first meeting spot of the Mob, telling her that if she hates singing that much, we'd all leave after giving it a try. Three hours later we were all tired and wanted to stop but she was urging us to continue on and sing until the very end. Needless to say she must have felt very comfortable with some part of the dynamics of the Mob. Perhaps it was because you were really nurturing to every single person that was there, helping people find they're spot without being demanding or expecting. Or perhaps it was because you instinctly knew when to move on or when to stop and let us sing our hearts out to the totally unexpected and overly joyed listeners. Remember when we went into the JP Project Housing and we sang to about 25 people listening to us in the cold out on their porches, and the one gentleman came down and told us that "this is what Christmas is really about". Or perhaps my friend just had straight up fun. It's really important to let go and hear yourself sing, even if you don't have a classically trained voice or even if you think that you have the worst voice in the whole wide world. I guess what I'm trying to say is that we all had a lot of fun singing with you and I'd definitely do it again, soon. Secret Plan: everyone got on the last car of the 1:15 inbound Orange Line train and started singing all at once. Performance art, yassir. 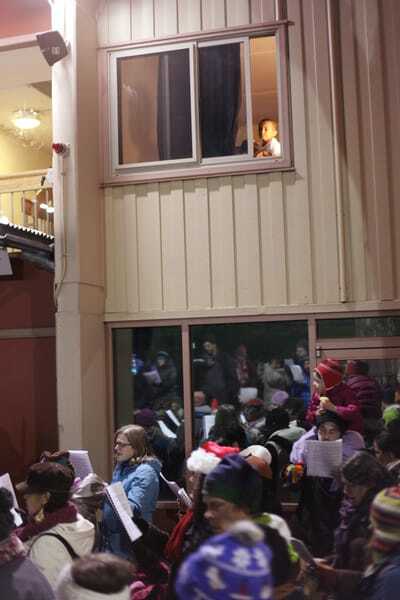 We got a few ladies in the car singing with us, though they would not join us to carol. We got off at the New England Medical Center stop and got the "White Christmas" crowd coming out of the Wang center. I think they thought we were part of the show. We went up past the opera house where the Nutcracker was playing and we sang in their entryway- nice acoustics!- ... Overheard comment: "...they look like real people!..." (as opposed to ...? I think they meant as opposed to paid actors and so forth, but it was funny out of context). Next we got on the Red Line to Harvard. Harvard Square wasn't so interesting from a caroling standpoint, but then we went to Burdick's for hot cocoa. Whoa! yoiks! Rich! This was a nice time full of warm fuzzies. No real great stories, just the kind of generous warmth that's the reason I started this event. People came out to listen; some people had their families and kids around; it was great. Some people took pictures, and if you were one of those, please send them to me. I'd love to update this site a little. Andrea talked to me at the JP social club meeting about adding this auxiliary JP date to the itinerary, for those out of town on, or wanting more caroling action than just, the 22nd. It was small (8-10 of us?) but fun! A highlight for me was breaking in on a Domino game to carol some folks, and having one of them completely outcarol us with "Noche de Paz" in a powerful baritone. Ha ha ha! Then we sang at a bar and got free hot cocoa and cookies, that was nice. A guy in the bar had us sing to his daughter's voice mail. That was sweet too. Our first stop, after warming up in Back Bay Station, was to go to the mall across the street. We sang Joy To the World in the first space we came to, and then realized that there was a brass quintet playing in the middle space of the mall (this is a very upscale mall, complete with marble floors, a waterfall, etc.) We went to the middle and asked them if it was ok if we sang another tune- they said, sure!- so we sang Longfellow's "I Heard the Bells on Christmas Day" (which was only subtly subversive, I thought). We finish. Security guard 1: Are you the leader? SG1: Could I see some ID? Security Guard 2: Are you the leader? 2 seconds pass. We are almost at the downward escalator. Security Manager-type woman: Are you the leader? We step onto the down escalator. SMTW: Would you come downstairs with me? SMTW: Could I see some ID? me: May I ask Why you want to see my ID? ...and so on. I didn't give anyone my ID. 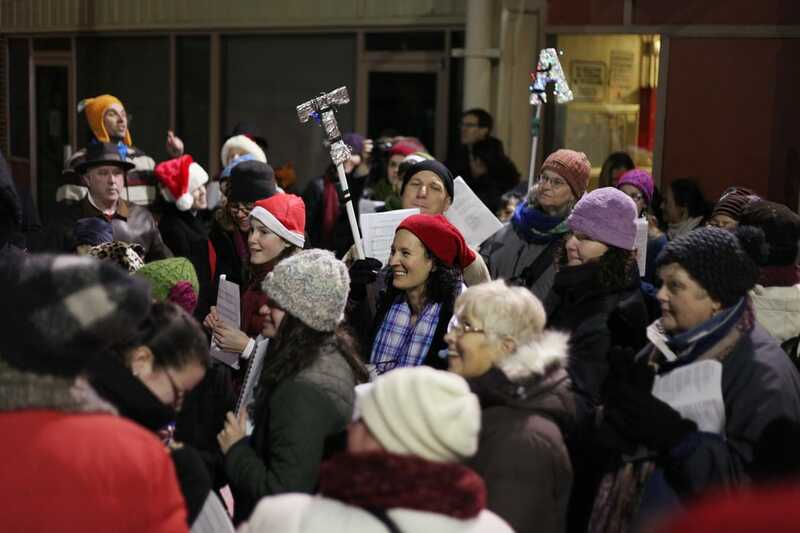 I found out later that there are elements of the world who have gone into that very mall to sing anti-corperate christmas carols, which might explain the rather hostile reception. Crazy. Well. People. b) Highlight for me (it was so beautiful): humming Silent Night in the BPL. The security guard THERE smiled and waved. Heh heh. Sorry to all my librarian friends, but well, we did only hum. "My best memory (Joe, make note for JP neighbors!) is of standing at the corner of Chestnut and Boylston, singing to one lonely lighted floor in one house set back from the road, thinking we were on our last legs. Did we even know if anyone was in there to hear us? 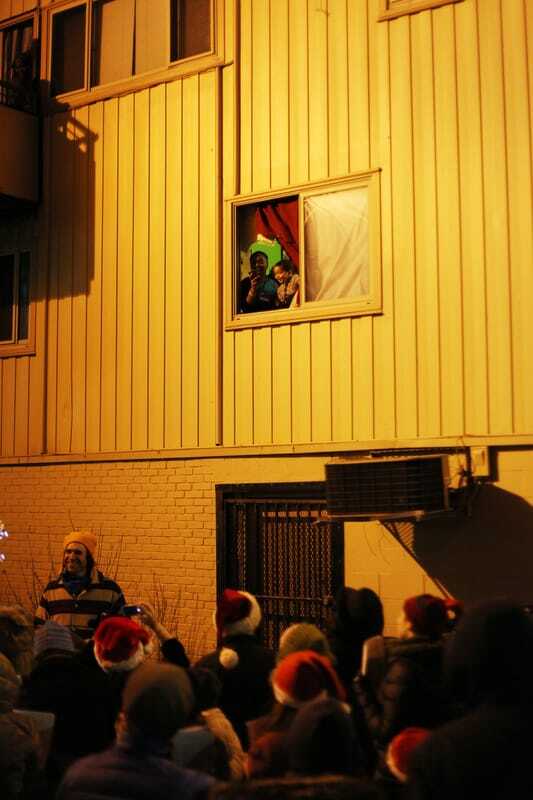 And by the end of the first song there were people at the windows of at least 8 buildings along the two streets, sharing in the mysterious joyful noisemaking taking place in the down below. What a great way to spread holiday cheer and true spirit! "